It would make life easier if you emailed the recipe and details requested above as an attachment in Word or Rtf, and put BookChook Cook Book in the subject line of your email. You can email me via the Contact Me tab up near my blog banner. Hey, nifty - I'm in! I'll share a recipe soon. Tif, I know exactly what you mean, but I have this vision of you folding yourself into an envelope, applying a stamp and slipping through the post box! But I just thought...Are you allowing meat in the recipes? Yay, Sally! It's also a handy tongue twister if one should feel so inclined! I figure people can decide for themselves which ingredients to leave out, Sally, even though cooking a chook causes me a pang or two! Interesting article on your blog! Oh me! Count me in! Will email soon. 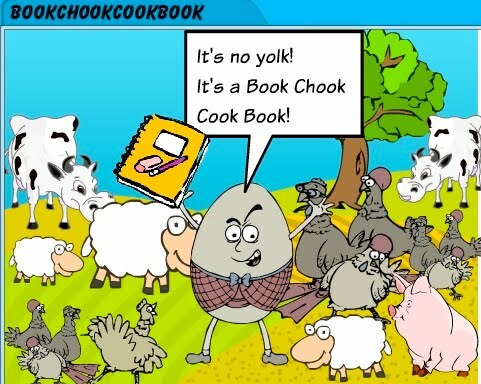 Oh and The Book Chook Cook Book, BAHAHAHAHA. Love it! Try and say it three times! I twied alweady and now my tung is tangled! you know, when you say Book Chook Cook Book several times it kind of sounds like a chicken bluck, blucking. if you put the right accent on the words, anyway. What a fun idea, I am in :) Now to think up a good recipe for the cook book! I speak fluent Chicken, Sally, so i am pretty sure my accent is right on the beak! Margo T, so glad you will join us and welcome to the Kidlitosphere! There are so many great literacy quotes in quote collections online - or it may just be something your great-grandma used to say. Whatever takes your fancy!